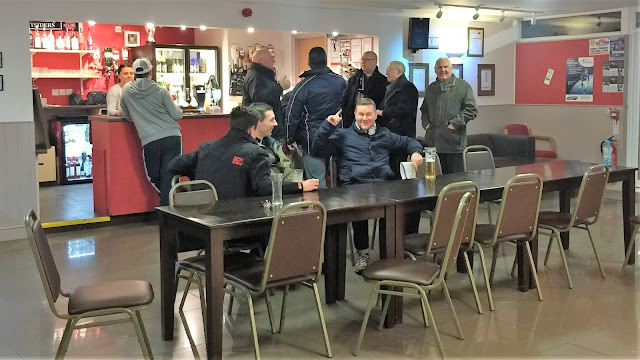 HADLEIGH UNITED FC was formed in 1892 and for the first 100 years of their history pottered around in local leagues, such as the Suffolk & Ipswich Leagues. After a sustained period of success, they made the step up to the Eastern Counties League in 1991, starting in Division 1. By 1994 they were champions, being promoted to the Eastern Counties Premier. 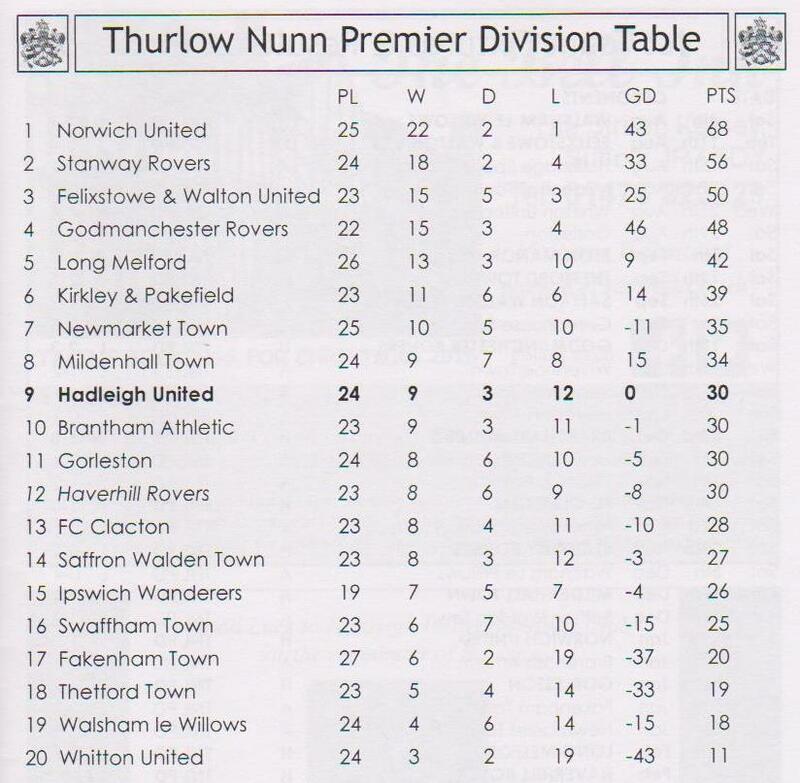 They generally found things tough at the higher level and in 1997, when only March Town United kept them off the bottom of the table. 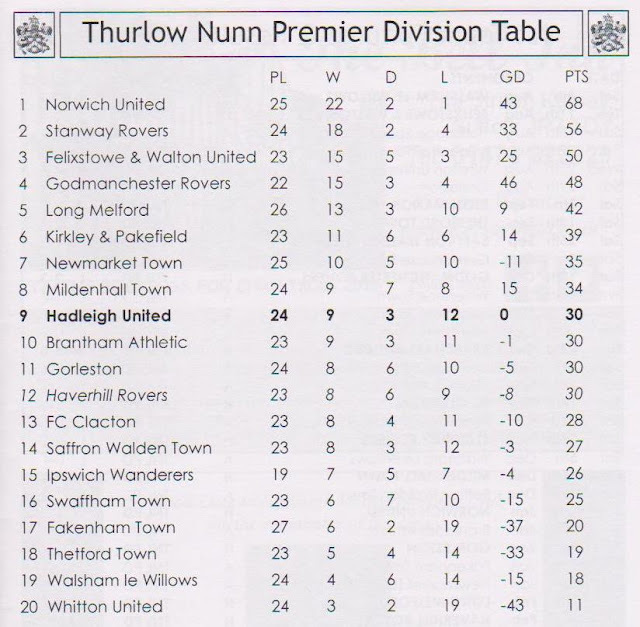 Reaming in Division 1 until 2009, a runners-up spot behind Newmarket Town was enough to see them promoted and since then times have been much better. They have remained in the division ever since, even winning it in 2014. 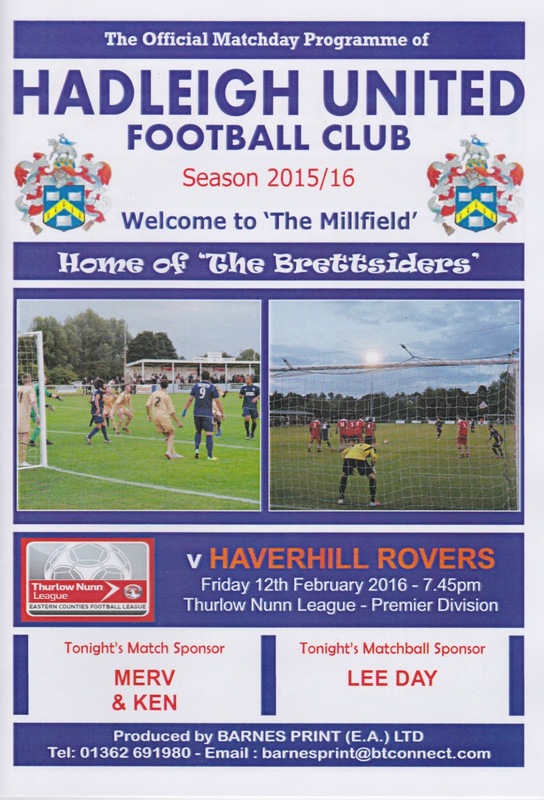 Before tonight's game, they were just above mid-table, sitting in 9th, whilst opponents Haverhill Rovers were in 12th. It was time for some more Friday night football, and thanks to the Eastern Counties League, I'd be seeing a number of games in their competition to finish off my week at work. 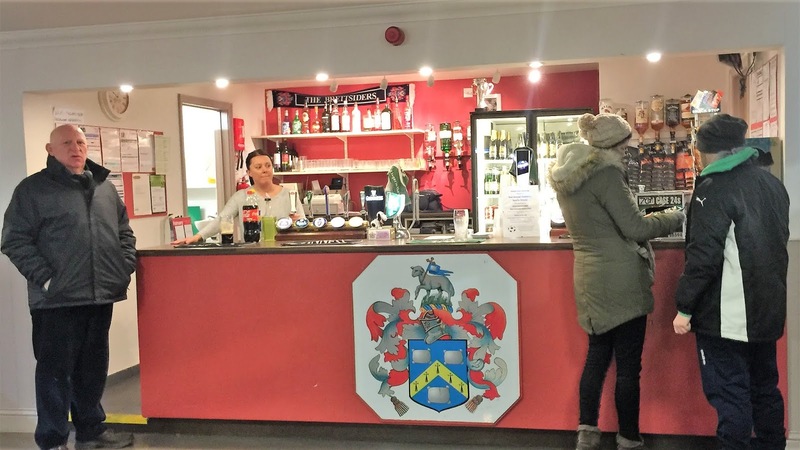 They are one of the few leagues to realise that you can attract extra fans and help out your clubs if you vary your kick-off times, and this case had been proven time and again. 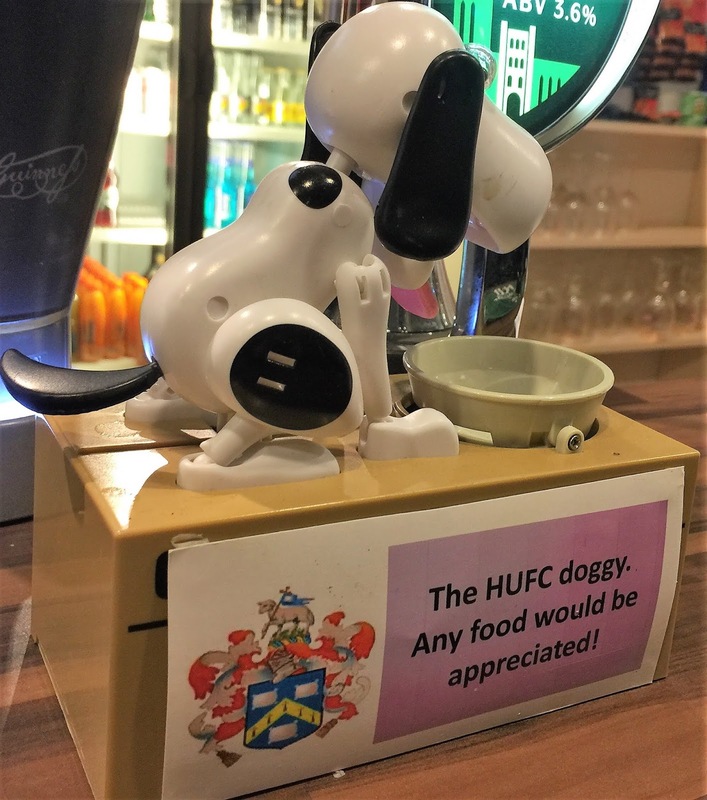 Though their 'groundhopper days' with staggered kickoffs had not been as successful as they could have been, due to clashing with established hops, Friday nights had been a different story. A number of extra fans had turned up to bolster the attendances, in some cases doubling the number of fans in the ground. On a personal level I'd had plenty of people willing to come with me - last week a couple of Braintree fans - Dan & Maurice had tagged along, and I was happy that fellow hopper Anwar would also be coming to keep me company for this Friday's match. On the day of the game, it was a fairly easy day at work, with me getting out at 12.15. I spent a couple of hours at home, looking online before leaving for Aylesbury at 3.15. I stopped off & B&M Bargains to get some Irn Bru and Toffee Crisps for tonight’s game before meeting Anwar just after 4. Last week the trip was hassle free as I’d left a bit earlier, but this week was anything but. We were delayed for 90 minutes in all, with some clown having an accident on the M25 meaning that the Sat Nav diverted us off at Enfield to take a back route. Usually, it gets us out of a tight spot but this time it just made things worse. We got stuck for an hour trying to get back on the M25 at the next junction up, with the traffic particularly heavy near Tottenham Hotspur’s training ground. Eventually, we got to Braintree to pick up the Braintree lads Dan & his cousin Maurice, who I’d both met a few times now. Luckily the journey over to the game was a lot better, though it was a tad slow on the last leg thanks to the narrow roads of Haleigh. 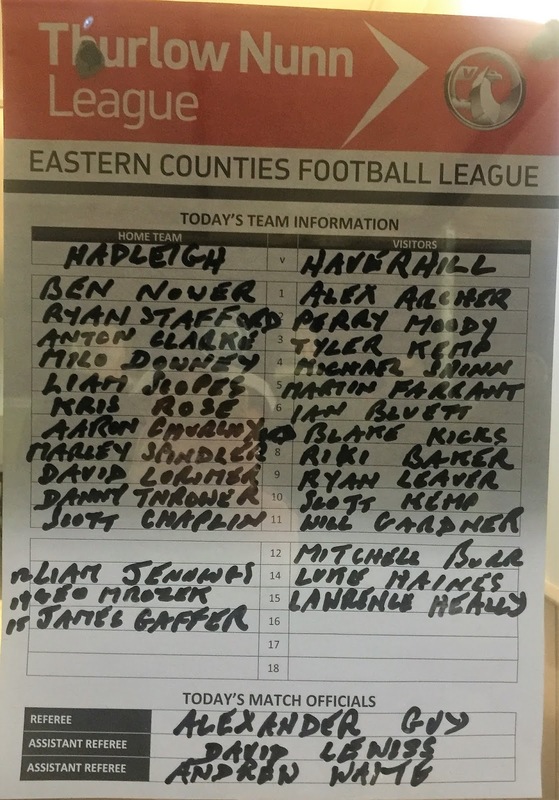 We got there with 10 minutes till kick off, and happily, for me, there were still programmes left, unlike at Halstead last week where they sold out well before kick off. After paying £7 entry and £1 for a programme I went into the bar for a quick pint of Aspalls before kick off. It helped to relax me after the stress of getting there, but there wasn’t long until kick off. 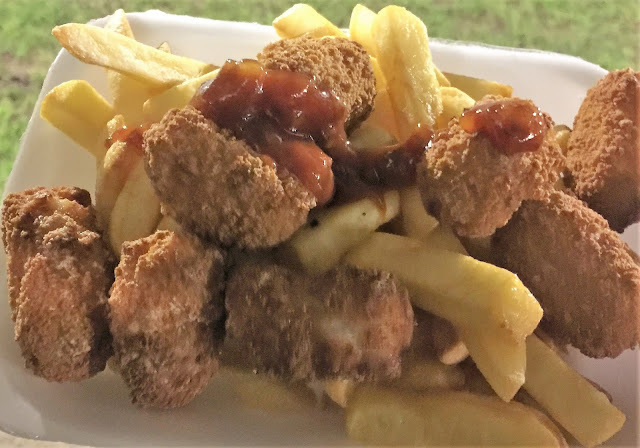 I was ravenous by now, and so got myself some Scampi & Chips for £3.50 from the tea bar. The lady running it was on her own and was swamped by orders, but coped very well. It was delicious too, but still hungry after that I munched my way through 3 Toffee Crisps and a bag of McCoy’s. Fellow hoppers Laurence and Chris were also in attendance and they witnessed a reasonably entertaining game. 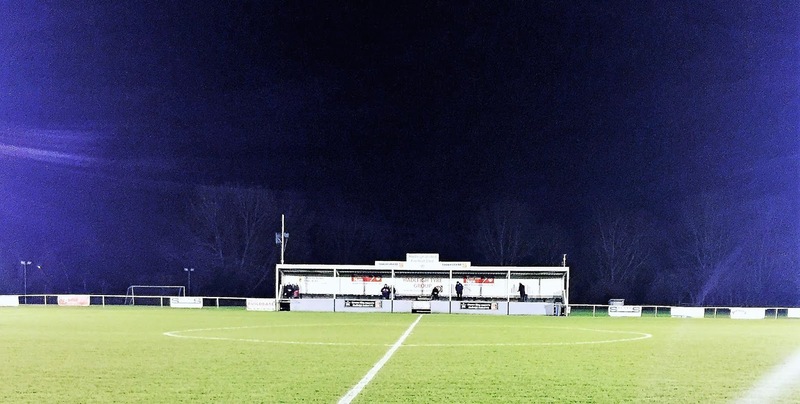 Ryan Weaver opened the scoring for the visitors on the half hour mark with a close-range finish and for a long time, it looked like it was going to be a frustrating game for the hosts, who despite going well had lost their last 3 games to Fakenham, Newmarket & Long Melford. Try as they might, they were having no luck in front of goal and it looked like it would take something special to break down the Haverhill defence. That proved to be the case, as on 78 minutes Anton Clarke scored a spectacular equaliser from 25 yards which flew in the top corner. One name I did recognise was the referee Alexander Guy, who needlessly called off a game I tried to attend at Felixstowe last season as he wouldn’t wait 10 minutes for the fog to clear, which really wasn’t that bad anyway. I may get that particular ground ticked next Friday, with Swaffham being another option out that way. After dropping Dan & Maurice off myself & Anwar made our way home. Our misery on the roads continued as there was a section of the M11 closed, meaning a diversion for ages on slow roads. All in all it added another half an hour to the journey, with me dropping Anwar back home at 12.15. The stress of the UK’s badly run road system got me tired, and I was feeling quite sleepy on the way home, so I had to have a few cans of Irn Bru to keep me alert. I got in just after half midnight, browsing the internet while having a very nice Dunton’s cider to cap the evening off. It had been another good groundhop - albeit with plenty of frustration. I’d be likely experiencing more of that the following afternoon in Wycombe’s home game with Exeter, what with our woeful home record. MILLFIELD is a ground that I visited back in September 2008, en route to Ipswich Town v Wycombe Wanderers reserves, hence the daylight pictures. Back then it was a smart and tidy ground with an attractive main stand, that held 250, with the ground holding 3000 in total. 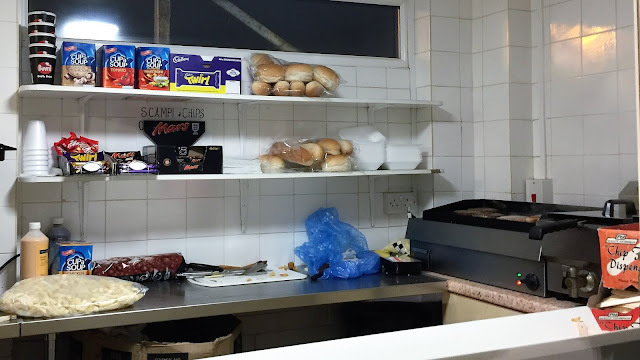 There is further cover thanks to an overhang on the clubhouse side. Talking of the clubhouse, it's a nice smart venue for a pre-match pint whilst the tea bar is also excellent.